From putting it in the garden to help the vegetables grow, through using it to purify water, to burning it as a clean fuel for the BBQ, charcoal has many familiar uses. Perhaps less familiar is biochar, an alternative term for a product that is identical to charcoal. Burning wood in an open fireplace results in the wood being reduced to ash. Burning it in low-oxygen atmosphere, in a machine called a pyrolyser, means that around 30% of the wood is retained as the solid called biochar. The way that biochar differs from charcoal is only in the use to which it is put. Biochar is differentiated through its use as a soil conditioner and as a means to sequester carbon in the ground. 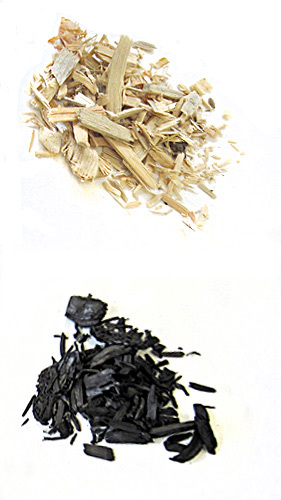 Biochar is produced through the process of pyrolysis. Pyrolysis is derived from the Greek ‘pyr’ meaning ‘fire’ and ‘lysis’ meaning ‘separating’ which nicely covers the process of firing organic material to separate out its gas, liquid and solid parts. Any dry crop, de-watered animal manure, or any type of organic waste material can be used as a feedstock to the pyrolysis process, of which there are two types – slow and fast pyrolysis. Slow pyrolysis means that the feedstock is held in the heating chamber for hours. It operates at a lower temperature and will consume the volatile gasses given off, leaving only the solid charcoal. The particulate size of the feedstock will vary depending on what the biochar is to be used for. Fast pyrolysis means that the feedstock is heated quickly and at a higher temperature. The wood ‘flour’ is processed in around six seconds at a temperature of up to 500 degrees Celsius. It is not burned, as in having an open flame, but is indirectly heated and for the wood to carbonize quickly, it has to be very dry and finely ground. The three separated outputs of a fast pyrolysis production system are syngas (around 10% of the input feedstock by weight), bio-oil (60%), and biochar (30%). Once started, the biochar manufacturing process is typically maintained using the syngas fuel produced by the system. Bio-oil is condensed from the gasses driven from the feedstock as it is heated, leaving the char to be disposed of. Bio-oil produced from this process has a relatively high water content which leaves the oil with a calorific, or energy, value of around half that of diesel oil. The bio-oil can be used as-is in a boiler, further processed to a range of chemicals, or to produce B100 biodiesel by removing water. As a source for manufacturing biodiesel, bio-oil is not yet economic even with the government’s $0.425 subsidy under the now terminated, Biodiesel Grants Scheme. Biochar is regarded as a product that can help solve pressing environmental issues by sequestering, or permanently storing, large amounts of carbon in soil. It has potential to attract carbon credits just like planting trees does. Biological farmers and permaculturists are also interested in biochar as a soil conditioner to improve the health of our soils and so increase crop yields. The use of on-farm organic crops and waste to produce bio-oil and biochar opens opportunities for farmers to add another income stream to their farms. For lifestyle block owners, where farm productivity tends to be low, energy farming has a potential to add $1Bn to New Zealand’s GDP from presently under-utilised land through initiatives like bio-char and bio-oil production on an energy farm.